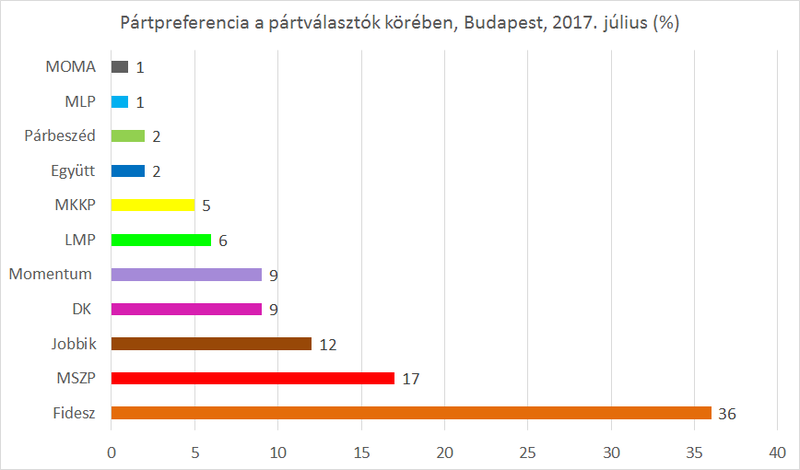 According to the results of the latest Republikon poll, this time exploring party preferences among Budapest residents, if it were just up to the Hungarian capital’s voters, Hungary would have a left-centre or liberal government following the spring 2018 elections. Fully 35% of all Budapest residents indicated that they prefer a new left-centre government, while 27% would rather see Prime Minister Viktor Orbán’s party remain in power for a third consecutive term, according to a representative poll based on 800 respondents. A further 11% of Budapest residents would like to see Jobbik, a party that is moving its image from that of a far-right party to the left of Fidesz, to form government. The fledgling Momentum party is strongest among Budapest youth. In fact, 56% of its supporters are between 18 and 39 years of age. But overall, the left-centre parties combined are equally present in all age groups. The only area where Fidesz is more popular than the left-centre parties combined is among voters who live in detached houses or townhouses and voters with the lowest levels of formal education. In contrast, the left has an advantage among Budapest residents who live in traditional apartment buildings and in socialist era suburban apartment blocks. Despite a very visible advertising campaign in Budapest and a more moderate image, Jobbik has not made many inroads in Budapest. The only exception may be slightly increased popularity among those who live in suburban apartment blocks. Here Jobbik’s popularity stands at 15%. Fidesz seems to be out of touch with a large majority of Budapest residents when it comes to investing in sports stadiums and arenas. For instance, 78% of the Budapest population opposes this. A large majority of Budapest residents of all political stripes, including 67% of Fidesz voters, also believe that a larger proportion of taxes collected in Budapest should be invested back into the city, including into critical transit projects, such as the ill-fated and bungled M3 metro refurbishment. 1./ It is not Budapest that has a Hungary, rather Hungary has a Budapest. It is not the Budapest voters electing the ruling party but the whole country. 2./ I am sure you do not need to much explanation about the strength of poling in the light of the US Presidential outcome, do you? I have six (6) comments on different articles being held up for “Your comment is awaiting moderation” but I have a strong feeling that I am on a hold pattern for being on a secret blacklist. Prove me wrong by releasing them for public consumption. I sent you several E-mails in the subject, please have the courtesy to reply. Thank you in advance. Every action brings a reaction. This ultra-liberalism has demonstrated that populism is that created, that is gaining worldwide popularity. Even in Europe. In the US the election of Trump really shuck-up the establishment. They are in panic mode. That is what the liberal-Democrats’ endless attacks demonstrates. It’s in its eleventh months now that they attempt to prove that Hilary lost, just because Trump conspired with Putin. yet not a shred of evidence so far, after eleven months of accusation and witch-hunts. It’s only a propaganda war, costing billions upon billions. Yesterday three surveys were disclosed. Trump’s popularity is 36%, 39% and one at 40%. But Obama hardly had his rating above 40% in his 8 years in office. His healthcare law, AHA, or Obamacare was unpopular from day one. Now that the Republicans attempt to replace, it is more popular than ever. That’s how thing go in life. Trump is so far, useless as president. He is NOT leading. Congress is in shamble. Democrats only oppose and booby-trapp eveyithing. The Republican can not agree on anything among themselfs. So Trump’s rating is low, but the Democrats are even a point bellow him. The masses are just fed up with the current affair of politecs. But there is NO third way. Beside Trump’s popularity among his supporters continues high. Is it not the same factors that cause the general consensus any place, as with Americans ? Us in England greatly admire your strong-arm leader Viktor, you are so lucky to have someone who loves their country and protect its borders. Like all major cities, Budapest is awash with liberals, snow flakes and general nation-traitors, don`t read too much into polls – get into the countryside to meet true patriots !